Salem, Massachusetts: the epicenter of cheesy witch merchandise and palm readers (although the memorial to those killed in the town during the 1692 witch hunt is a must-see) is, at least until June 19th, the place outside of Europe to see some of the great 17th century Dutch and Flemish masters. The Peabody Essex Museum is displaying about 70 highlights from Marblehead couple Eijk and Rose-Marie van Otterloo’s private collection, estimated to be worth between $200 and $300 million. I’m guessing they have an excellent home alarm system. The paintings are so painstakingly detailed for their size that the museum offers magnifying glasses for viewers—although I couldn’t get my hands on one; it was a Sunday afternoon when I went, which is peak rush-hour museum time, to be sure. The museum will be open late June 14-June 17 if you want to head there after work and avoid the crowds. 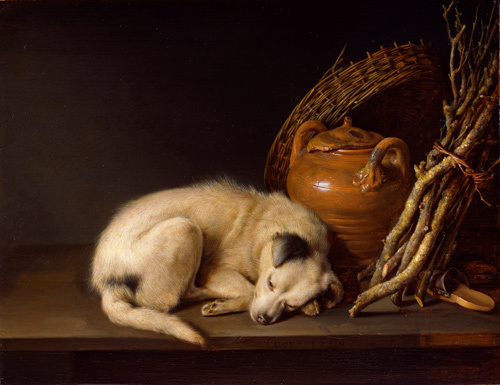 Gerrit Dou’s Sleeping Dog is so tiny, the image below is practically the piece’s actual size. You can see every hair along the dog’s back, hind quarters and tail. It made me wonder about the brushes the artists used to create these types of photographic-quality paintings. The Dutch and Flemish masters excelled at depicting everyday people, objects and scenes with the same devotion and sense of wonder that they spent capturing their grandest subjects. Their work gives us a window into the ordinary lives of their countrymen and women, showing us what life must have been like. 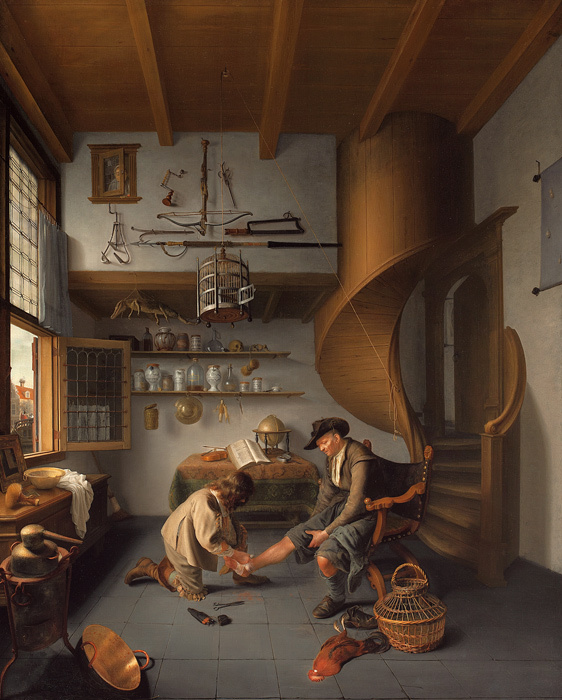 Check out the barber/surgeon (he had his career bases covered) busy tending to a patient in his tidy office, where the open window offers a tantalizing peek into the outside world. He is a learned man: there is a violin, open book and globe on the sideboard behind him. Tools and medicines line the walls, and what looks like a dead baby crocodile hangs from the ceiling. According to my dad, an avid art historian, hanging scary dead baby animals was believed to help ward off evil spirits (not to mention squeamish customers). A woman—the barber’s wife?—spies on us from upstairs, while a dead rooster lays outside of its straw cage, payment for services rendered. The ordinary becomes extraordinary thanks to the extreme skill and pride these master artists displayed. Their art also often imparts moral lessons, such as the dangers of partying too much, shown below by Nicolaes Maes. 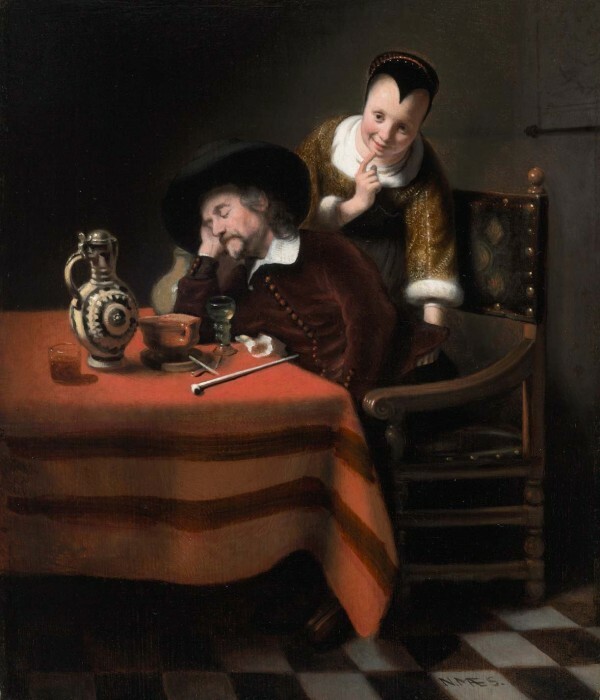 This painting is remarkable because one of the subjects addresses the viewer directly, warning us to be quiet lest the drunken man whose pockets she’s picking wakes up and catches her in the act. 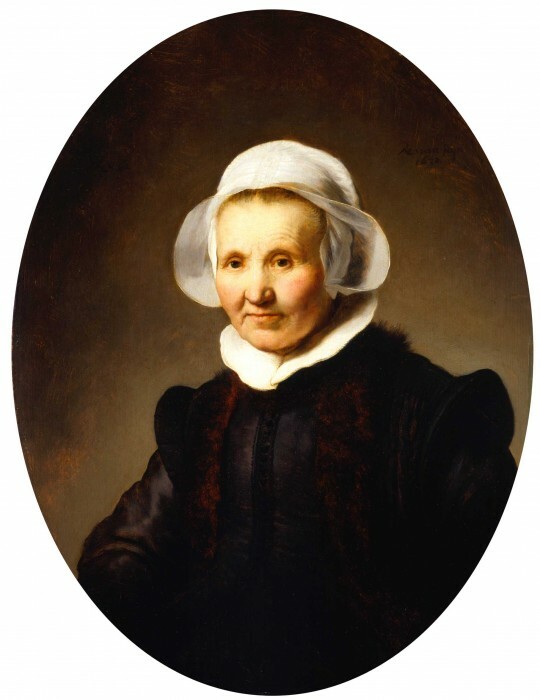 No show on Dutch and Flemish masters would be complete without a Rembrandt; one of the exhibit’s very best paintings is his sensitive and luminous portrait of Aeltje Uylenburgh, completed when Rembrandt was just 26. It shows a dignified, confident woman staring down old age. You can read more about the exhibit and the van Otterloos’ passion for collecting in these pieces by Sebastian Smee for The Boston Globe and Julia Sutherland for The Financial Times, and of course, on the museum’s website. I saw this show with my friend Laurie. Truly amazing! Some brushes consist of ONE bristle/animal hair, and even these artists worked with magnifying lenses and/or had very myopic eyes, that allowed them to see up close. thanks, Dottie. I’ve been meaning to get up to Salem for months now to catch this show, and I’m so glad I finally did. I was picturing these artists plucking a hair off their heads and using a single strand to paint, based on what you’re telling me I guess my visual wasn’t too far off! oh you artistic girl! nice review. Rembrandt is my absolute favorite artist. I have seen his work in Stockholm, Paris, St. Petersburg, New York, and now I will have to trek to Salem. Thanks for the post.